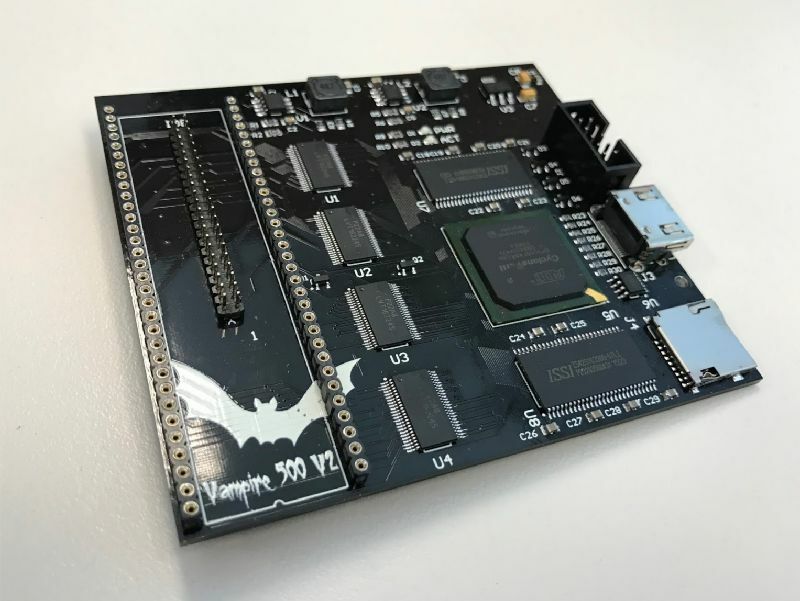 The Vampire is a series of FPGA-based accelerator (and more!) cards for the A600 (and others). FPGAs (field-programmable gate arrays) is a integrated circuits that can be programmed after being soldered on their boards and used by their customers. They can be used to design specialised integrated circuits, before their "hard-wired" productions or to change the behaviour of the circuits after deployment in the field. FPGAs are composed essentially of two types of components: logic blocks and routing channels. Logic blocks are components made of a set of more basic components, e.g., a flip-flop. They can be reconfigured in the field to provide different logic gates, e.g., NAND. Routing channels allow the interconnections of logic blocks to realise complex functions. Therefore, FPGAs alone cannot do anything. They must be programmed or, in FPGA-speak, they must implement a soft-processor core. The Apollo/68080 Core is such a soft processor, i.e., a processor implemented as a piece of software to program the FPGAs. It is 100% compatible with the Motorola 680x0 family of processors, fixes many of their bugs, and is faster than a 68060 at 100Mhz because running on a Intel/Altera Cyclone III FPGA. The core can be updated by the customers of the FPGAs. One popular core is the GOLD2.10 version. It is developed using VHDL. It cover all (or almost all) instructions of the 680x0 processors. It also brings architectural improvements to make the processor even faster, e.g., conditional rewrite, and to add new features, e.g., multimedia extension. The core comes with the SAGA core, which provides a improved reimplementation of the Commodore AGA Chipset. This SAGA core can be used for retargetable graphics with the appropriate drivers to obtain 24-bit graphics through the HDMI port of the Vampire card. 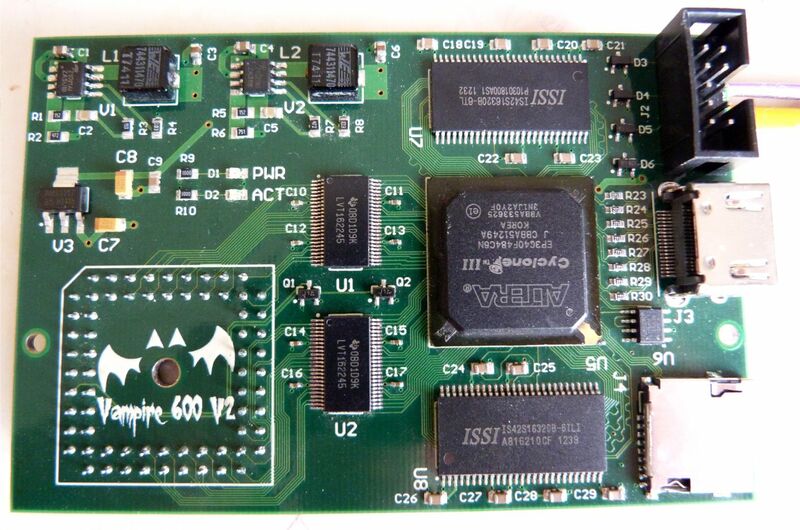 A Vampire card typically features a Intel/Altera Cyclone III FPGA, a MicroSD card slot, a HDMI female port, and a JTAG port. Thus, they provide everything that Amigans can dream of: performance, compatibility, digital video output, and extra disk or even an Ethernet connection! A Vampire card usually plugs itself atop the Amiga processor to take over the control of the computer. Vampire A600 v1: the first design for A600, without MicroSD card slot and HDMI port. Vampire A600 v2: the best design for your A600. 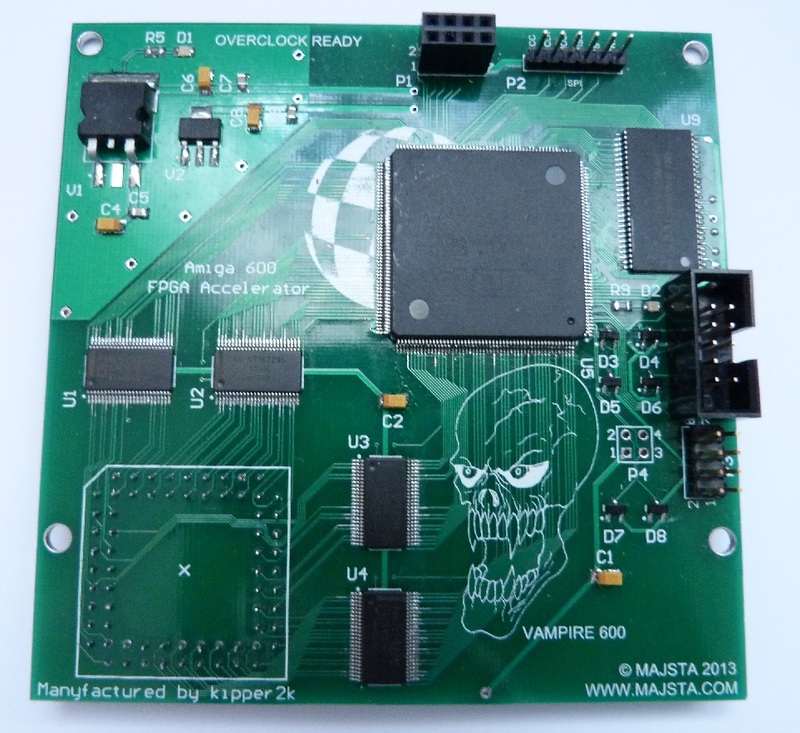 Vampire A600 v3: under prototyping... .
Vampire A500 v2: the Vampire v2 for A500. 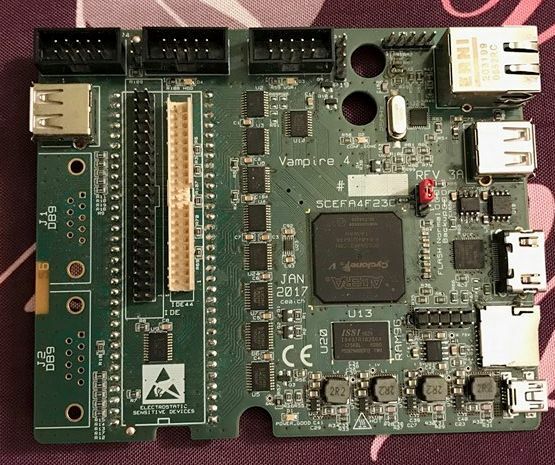 Vampire v4: a stand-alone Vampire/Amiga computer! a Ethernet card to access the Internet from the A600. There exist a very good mount that can replace the useless RF modulator for only 15€. Kipper2K also used to manufacture a mount but it seems to be discontinued and difficult to find! The A600 v2 Vampire card does not provide an extension port as the A500 v2 does, so the only solution is to use the MicroSD card slot. This solution uses a combination of a ARANANET and a ENC28J60 Ethernet Module. The ARANANET (also called SDNet Adapter) "converts" the MicroSD card slot into a SPI Interface, to which can be connected an ENC28J60 Ethernet Module that provides an Ethernet port. The combination ARANANET and ENC28J60 Ethernet Module can be bought separately or in combination. They can be used with either the Vampire v2 for A500 or A600. There is little information about their installation but an English and a Portuguese Web sites, Retromania.pt, describes the steps quite simply . I have bought my Arananet and ENC28J60 module from Relec, friendly and fast and they give you a nice Swiss candy , for only 42 CHF, about 55 dollars. I describe the connections between the two components here.